Mable Mutamba, 37, a breast cancer patient, poses for a potrait at her sister's home in between chemotherapy sessions for a tumor that has burst through the skin, in Kampala, Uganda, July 21, 2013. 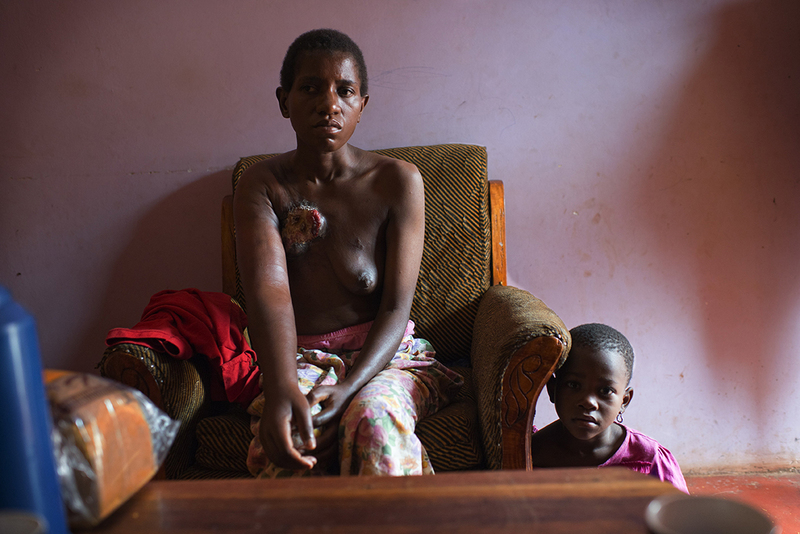 Mable, like so many other women in Uganda, waited until her cancer was in the advnaced stages, and the tumor had burst through her skin and eaten away a large part of her breast, before seeking medical care at the Cancer Institute. She found a lump in her breast roughly two years before, and tried traditional medicine consisting of boiled herbs, which proved unsuccessful. While Uganda was able to get a handle on the AIDs epidemic through ARV drugs and assistance from the international community, the country still struggles with how to treat and diagnose an overwhelming number of Cancer patients across the country. Thousands are currently being treated by only a handful of trained Oncologists in the entire country of Uganda; basic chemotherapy and Cancer medicines are often in short supply or unavailable, the radiation machine is outdated, in-patient beds are limited, and most Cancer patients can not afford transportation fare to reach diagnosis and treatment in Kampala from villages across the country.